Heat oven to 400°. Process crumbs, sugar, and butter in a food processor until evenly combined. Transfer to a 9″ deep-dish pie dish, and press into bottom and up sides to create a thick crust; set aside. Combine juice, milk, and egg yolks in a bowl; beat on medium-high speed of a hand mixer for 5 minutes. Pour into prepared crust; bake until crust is browned and filling is only slightly set, about 20 minutes. Place wafers around edge of pie, pushing them gently into filling; let cool. Freeze until set, at least 2 hours, or up to overnight. 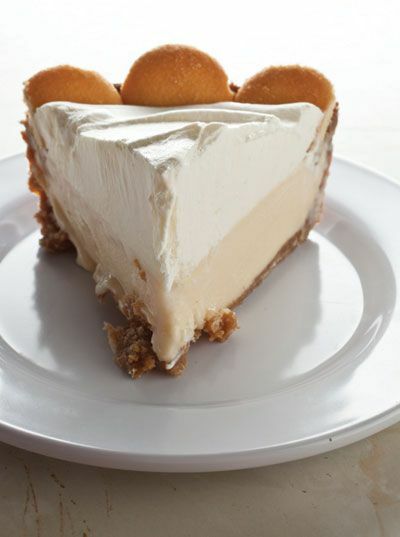 Whisk cream and vanilla in a bowl until stiff peaks form; spread evenly over pie and refrigerate until ready to serve.